When we ship a product, our commitment to the customer doesn’t end there. We follow our products to make sure they work in the customer’s environment. We were working on a transformer for a power supply manufacturer for the medical industry. There was a 3 week lead time from our supplier for the core we needed and the customer was concerned about keeping their project on time. We told them we could build a test transformer that would allow them to stay on track, but it would not be the final production transformer. We built a transformer utilizing a core we had in stock and modified the windings accordingly. The transformer worked, but the inside diameter was too small, making it difficult to mount—you would have to drill down into it while avoiding clipping a wire. After some thought, we realized we could solve this problem by sleeving the product. We came up with a plastic sleeve that was UL approved and that eliminated the need to drill down. We simply needed to counterbore the part. 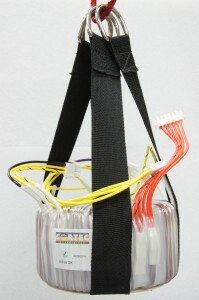 Although the final transformer would not require sleeving, we knew the customer would like it. We used the sleeving on the prototype and they loved it. When we completed the transformer, the finished product weighed 50 lbs. This created a problem for the customer on their production floor. Due to union constraints, their employees were only allowed to lift 40 lbs. So we went on site to observe the process and came back the following week with a solution. We worked with a parachute maker to build lift straps for the transformers and we changed our shipping containers to install the straps during the shipping process. The customer could then move the whole box to the production area and use a lift to move the transformer directly from the shipping container onto the work area. Based on their feedback, we also modified our manufacturing process for the customer to enable them to easily center the transformer on the mounting screw, which had previously been a long and tedious process. By working closely with, and listening to, our customers, we are able to build products that not only work, but that help simplify the customer’s production processes.